Mesa Verde National Park in southwestern Colorado has fascinating cliff houses. It also gives visitors a unique glimpse of the 700-year civilization of the Native Americans named the Ancestral Pueblo People who built the structures. They thrived and disappeared before Columbus set sail. Over 600 cliff house sites have been found along the overhanging canyon walls. 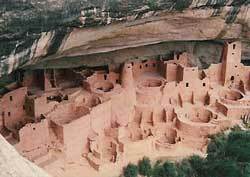 Below are the best known ones (the first three are at the mesa named Chapin, the most popular destination in Mesa Verde). This well-preserved multi-storied building complex has over 200 rooms plus some towers. It is nearly everyone's favorite. The 45-room multiplex nests high up a steep canyon wall. This 60-room development has the highest tower in Mesa Verde. Other must-see cliff houses include Spruce Tree House and Long House. Cliff Palace and Square Tower House (west and southwest facing) are best photographed in the late afternoon. Balcony House (east facing ) is best shot in the morning light.